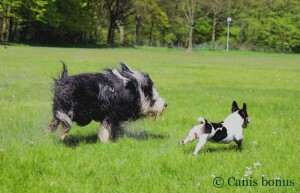 Reference article about dog rules and regulations in The Hague. This articles gives you a summary of the dog regulations in application in The Hague. Please regularly check with the municipality website for possible updates. Dogs must be kept on a lead except where marked otherwise (‘uitrengebied’, ‘uitloopgebied’, or ‘uitlaatplek’). Non-compliance is punishable by a €60 fine. You must clean up after your dog everywhere in the city, including off-leash areas. Non-compliance is punishable by a €90 fine. Dog owners must carry the means to clean up after their dog (paper or plastic baggies or a small scoop) at all times. Non-compliance is punishable by a €60 fine. Dogs are not allowed in children’s play areas or where the signpost ‘verboden voor honden’ is present. Non-compliance is punishable by a €90 fine. Dogs are not allowed to run off-leash on the beach (day or night) between 15 May and 1 October except in designated areas. Owners of seeing-eye dogs are not obliged to clean up after their dog. I regularly set out with my dog to check out good walks in The Hague and region. In Canis bonus Green Secrets The Hague, you will find detailed information on these walks with photos and details of parking, directions, but also information about the local regulations in effect. Besides official regulations, common courtesy apply when you are out and about with your dog. For additional tips in good dog etiquette when you are out and about with your dog in The Hague, see Dogs as embassadors. This entry was posted in Dogs and society and tagged amende, belasting, boete, chien, den haag, dog, dog tax, fine, hond, la haye, law, legislation, lois, loose, loslopen, off-lead, off-leash, offlead, offleash, promenades, regles, regulations, rules, tax, taxe, taxes, the hague, walks, wet. Bookmark the permalink. Post a comment or leave a trackback: Trackback URL.